→Vortex Crossfire 2 Review–Reliable & Quality at Multiple Ranges! With the ability to provide superior reliability and some of the best adjustments with a simple yet very performance-oriented construction – the Vortex Crossfire II is a fantastic choice for anyone. 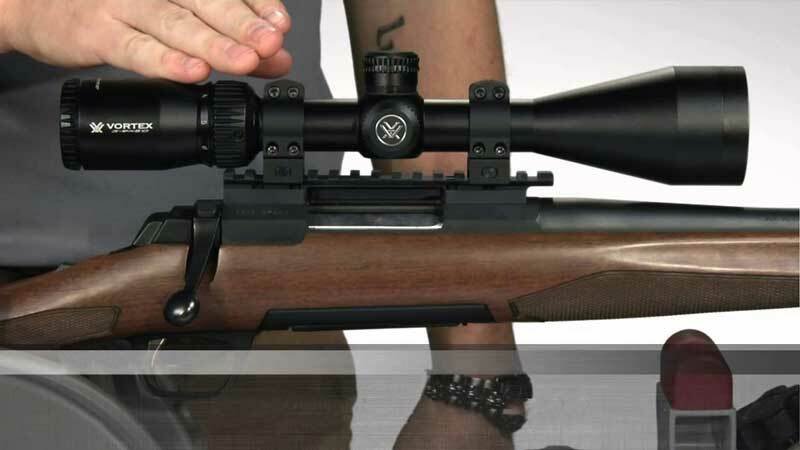 Coming with almost everything you need to shoot accurately and comfortably, there’s virtually no doubt how good this scope model is. Particularly, when you contemplate the vast array of options, you can find for the CrossFire II, including multiple magnifications, different sizes, and overall build for either mid or large range shooting. One of the most sought-for features of the Vortex Crossfire scopes is the chance to pick among three different reticles according to the user’s needs & desires. While the small 1-4x24 model offers the V-Brite and V-Plex reticles, the former for dynamic low-light hunting and the other for a more general application, the largest sizes 3-9x40 and 4-12x44 come with the additional Dead-Hold BDC reticle, an excellent design for superior customization and adjustments that ensures much more accurate and precise shooting. Especially for the long-range lover, these fantastic reticle options come incredibly convenient for when you need to consider much more than just what you find better-looking. This way you get better performance if you choose the right one. The single-piece tube at 30mm or 1 inch depending on the model is one of the best you will find regarding quality, strength, and durability. And that’s without mentioning the multi-coated lenses with anti-reflection. Made of aircraft-grade aluminum with a top-notch shock-proof design, you will also receive an exceptional O-ring sealing and nitrogen purge that makes the Crossfire II incredibly resistant both to water and to fog. What’s better, the entire construction is made to provide a long-term performance in any weather & condition. It is reliable to the point of becoming your best friend no matter where you are. It’s always there to help you make the best shots. A scope that stands outside the crowd is a scope that delivers something that others do not. And the Crossfire 2 does it, but not in a general or standard feature, but in the eye relief & eye box designs. Yes, this eye-relief build from the Crossfire 2 allows users to get faster and much more accurate vision through the lens without sacrificing comfort or convenience. And of course, the reticle focusing adds more magnificence into the design – allowing users to fix the point to their target in a wide array of configurations & environments without problems. A fast-focus eyepiece such as the one that comes with the Crossfire 2 can’t be ignored – especially if you are someone who likes both quickness and accuracy. With one of the best fields of views out there, the adjustments available for the Vortex Crossfire II are of the highest quality you will find. The reset turrets, for example, are capped entirely and adjustable, making it more comfortable and much more convenient to change configuration and meet your expectations. And if the setting didn’t work for you at the first time, you can quickly come back to the originalconfiguration and start again for even more convenience when using. And what makes the adjustment design even more convenient is the MOA clicks that help to know when the change was made. So you won’t have to rely on your tact only, but you will also have the click sound to change your configuration more comfortably. Even in the smallest design and with the V-Plex reticle, you can get an exceptional night-vision that you won’t get with any other model of this kind. But when it comes to using the V-Brite illuminated MOA reticle, the night-vision feature multiplies exceptionally in quality. The reticle becomes the perfect point for shooting in low-light environments, even in the most extreme of cases you won’t have any problem locking your target in aim. The short 1-4x model offers excellent magnification at all of its levels, and the 3-9x version does too. But the 4-12x model is not exactly the most reliable &precise when it comes to magnifying at sight. The problem is not that it does not magnify correctly or that it becomes hard to see through it, but as the Crossfire II is mostly for versatile & dynamic performances, it is not the best when it comes to long-range shooting. According to many users, at 12x magnification and even at 9x for others, the vision gets slightly blurry and fuzzy, to the point of becoming annoying to see through. This makes it harder to shoot accurately at long-range, so not the best if you are trying to hunt something that’s more than 200 yards away. Can the Crossfire 2 Meet Multiple Needs? Considering the three primary models the Crossfire II offers, the features, the quality, the overall usage, comfort, and build – it can be said that the Crossfire II can indeed meet the needs of any user without problems. For mid and long-range scope model, you will receive an outstanding construction that won’t break for years, that won’t harm your experience with any contaminant (moisture, dust, debris, etc.) and that won’t ever make you fail as long as you don’t expect more than it can offer. Of course, it is an entirely reliable & top-notch option for everyone. Just consider the slight drawback on its magnification (something not to overlook), and you will very likely find out if it works for you or not. In a general term, however, the Crossfire II is pretty good to the point of excellent, especially when considering its cost.